When I’ve tried drying roses in the past, it’s been a bit hit and miss. They don’t always keep their colour and often go brown. They’re best dried in a dark and airy place, which I didn’t have – until recently. The Optimum P200 dehydrator not only keeps the contents in the dark, but it has a fan to keep the air circulating. See more about this handy piece of kit in my review. As the rose petals dried, the house was filled with the heady scent of high summer. CT thought it was like living in a Turkish Delight factory. When the roses had dried, not only had the colour not faded, but it had deepened quite considerably. I was surprised to find that despite losing much of the scent, the flavour was still prominent. Pick your rose when it’s just come into full bloom and is at its best – do make sure it has not been sprayed with any pesticides or other chemicals. Your rose needs to be dry when picked. Any damp is likely to make the petals rot and turn brown. Mid-morning is the optimum time when any dew has had a chance to evaporate, but before the scent dissipates. Pluck the petals carefully from the base of the rose. Lay the rose petals out in a singly layer on mesh trays, placing them well apart so the air can circulate freely. Put the trays in a dry, dark space which has plenty of air movement. A dehydrator is ideal for this. Leave for several hours, until the petals are crisp and have deepened in colour. I used my Optimum P200 dehydrator and put it on the lowest setting (35℃), the rose petals were ready after five hours. Place in an airtight glass jar and store in a cool dark cupboard. Ideal for decorating cakes and desserts, grinding into a powder to use as a flavouring or colouring or for making pot pourri. I ground a few of my rose petals into powder and blitzed the rest with some golden granulated sugar to make rose sugar. I used both the powder and the sugar to boost a couple of rhubarb recipes I was making. The flavour of rose combines incredibly well with tart rhubarb I’ve found. The rose sugar added a touch of complexity and sophistication to this remarkable rhubarb cake and the rose powder gave a beautiful colour to the rhubarb and rose compote recipe below. I also scattered some of the powder over the accompanying rose cream. 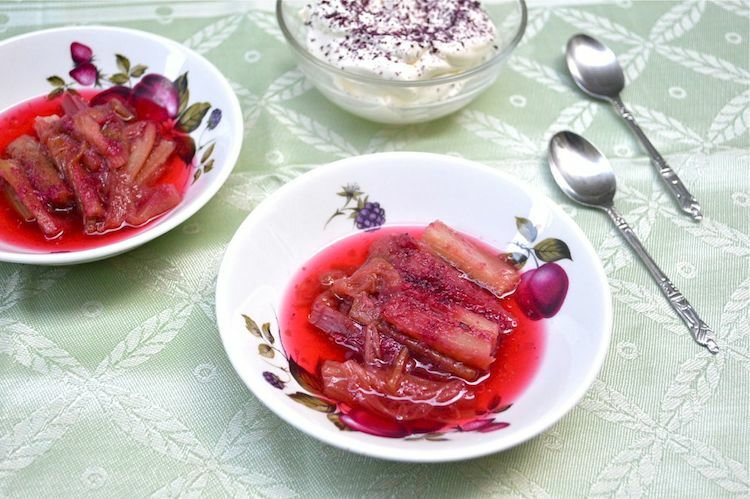 Tart rhubarb simmered with rose syrup or rose sugar. Served with rose cream this makes for a simple but sophisticated dessert. Cut the rhubarb into small batons, about 1 cm by 4 cm. Simmer the rhubarb in the rose syrup for 5 to 10 minutes or until just soft. If using rose sugar instead, you'll need to add 1 tbsp of water. Add the rose powder a couple of minutes or so before the rhubarb's finished cooking. Serve with a goodly dollop of rose cream. Whip the cream and rose syrup in a bowl until soft peaks form. Be careful not to over whip. Spoon into a serving dish and dust with the rose powder. I’m a Froothie ambassador and this post contains affiliate links. Buying through a link will not cost you any more, but I will get a small commission. This helps keep Tin and Thyme blythe and blogging. You can find out what other recipes I’ve made using Froothie equipment on my Full on Froothie page. Opinions are, as always, my own. This is AWESOME, Choclette. I need to get my dehydrator out and make some too! That rhubarb compote and rose cream…simply heavenly! Thanks Angie. It makes for a lovely light summer dessert. And oh yes, do get your dehydrator out. If I had more roses, I’d dry loads of them. A few days ago I made your rhubarb cake again, with the addition of some rose jelly and a good quality rose water and this taste combination, with whipped cream, was divine ! What beautiful photographs and I love the rose petal powder. 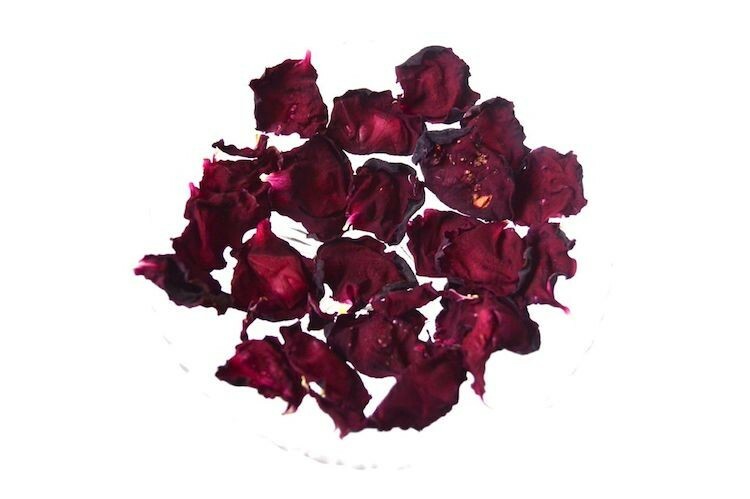 I have still to decide what to do with my dehydrated rose petals, they are much lighter than yours as my rose is pink rather than red. Lovely idea to combine the roses and the rhubarb, a great combination. Thank you Janice 🙂 Pink is such a pretty summery colour. Weren’t you going to scatter them over a cake? That Rose is beautiful! I love rose bushes. Your recipe sounds really good and a great way to end or even start a meal. What is double cream? Is that like heavy cream? I wonder what to use to make it vegan? Such a beautiful dish, I’m imagining how wonderful your house must have smelled too. It was amazing Natalie. I wasn’t really expecting the scent to waft around, so it was a very pleasant surprise. I use rose petals in a lot of my Indian sweets but I dry them in my airing cupboard.This recipe sounds really delicious. Dried rose petals are wonderful aren’t they? An airing cupboard should be ideal. We don’t have one, so the dehydrator is perfect. I think I need to get hold of the Froothie Dehydrator as I really really need to do something with all the roses out in abundance. These dehydrators do sound like a good piece of kit! And Rose sugar?! Divine! I’m loving the dehydrator Sus. I’ve got loads of plans, just need to get on with them! Reminds me of a lovely recipe I would love to try, all I need is a dehydrator. Love how ur OH compared the aroma to a Turkish delight factory! CT has a habit of coming out with odd things 😉 You are teasing me with your recipe Manjiri. Now I want to know what it is. I’m quite envious of your roses Johanna. I’d love to have a garden where I could grow more of them. I’m astonished ours survives at all with virtually no sun all year round. Scattered over a cake, rose petals (dried or fresh) are just lovely. You’re being far more adventurous with your dehydrator than I am. I need to get out in the garden and see what I can find!